I was anticipating a 2.5 hours bus ride, but it was 5 hours. We had a pit stop and another lady asked if I was traveling alone. We chatted candidly about female solo travel and it was easy to find common ground immediately. 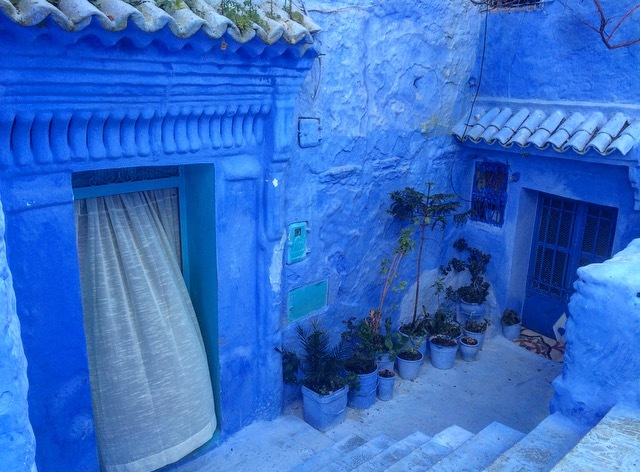 Once the bus arrived in Chefchaouene, we shared a taxi to the medina and exchanged information, later having dinner together. After dinner we wondered around the square and in every direction, the streets were completely flooded with young Moroccan men. I mean, shoulder to shoulder--this is a small mountain town--where are all the boys and young men coming from--what the hell is going on? My friend thought maybe it was some dating ritual, but I didn’t see any girls around. I bailed, preferring a quiet rooftop. I grabbed a bottle of tonic water and a snack to sit on the rooftop of the hostel I was staying in. I popped the metal top off of the tonic water and it rang like a champagne bottle. I was in the dark, and the cap smacked me in the face and bounced around the floor. I touched my face, glad it didn’t hit my eye, and after a few sips saw the blood on my fingers. Bottle cap face wound. Got 'em. The next morning I woke before sunrise so that I could watch it. I stepped out for a walk to take some pictures of the Blue City, only feeling like a d-bag for creeping around in the early morning with a camera while the kids are headed to school or people to their work. 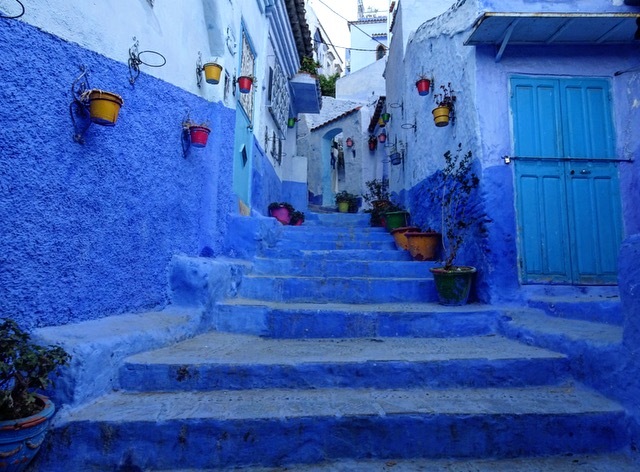 Chefchaouene is the most photogenic city I have ever seen. It’s small and compact and the colors are out of control, so it didn’t take long to feel satisfied with photographs, and I bailed quickly. I spent the day hiking to the Ackours Waterfalls in the Riff Mountains with some other people I met. 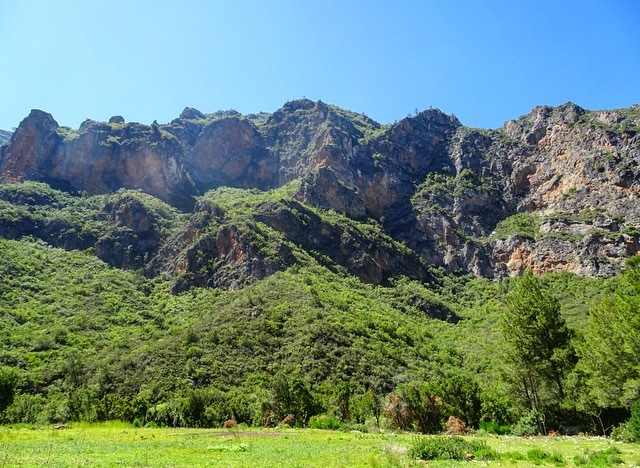 Green mountains and farmland that appear untouched was a welcome scenery change from busy medinas. On my last morning in Chefchaouene with my sketchbook and watercolors with me, I found a quiet corner to sit and look at some blue doors. I feel sensitive about invading the privacy of home fronts, so I sat off to the side and it seemed a very quiet spot. After a little bit a man came to sit with me. He is an artist too, and later I was able to admire the drawings he did of his small town. He wore a NY Yankees cap like so many men I saw throughout Morocco. I’m still wondering if 'Jay-Z made the Yankee hat more famous than a Yankee can', but I digress, it is a popular hat though. The young guy left me to tend to his shop and then another young boy came by and hung over my shoulder watching me and gesturing so happily, pointing to himself, the house and my drawing. Two girls came to the do same, and it turned out it was their home. They were so sweet about my place sitting in front of their home. We went over the colors of my watercolor set in English and in French and later another young girl came out from one of the homes and sat so close, almost on my lap to watch me. She said, “beauty” and she pulled out a phone to show me pictures she had taken of her little city at various times. I’m sure the tourist invasion gets old, but it was sweet to find a way to capture a place rather than taking a photograph, and to share it with a young group that is well aware and enamored with the beauty of their own front steps and in their backyard.